A reader asked me how to create a looping ending. In another post, I explain how to create a looping introduction. Although the technique that I came up with is different from the one for a looping introduction, it’s quite easy. 1. Create your ending slides in a new presentation and save the presentation. If you already have saved your main presentation, be sure to save this presentation in the same folder! 2. Choose Slide Show> Set Up Slide Show (or Set Up Show). In the Set Up Show dialog box, choose Loop Continuously Until ‘Esc’ and click OK.
3. Set up automatic timing for your looping ending. Select all the slides in the Slides pane (click the first, press and hold Shift, and click the last). In PowerPoint 2003, choose Slide Show> Slide Transition. In PowerPoint 2007, click the Animations tab. In PowerPoint 2010, click the Transitions tab. In 2003, in the Advance Slide section of the Slide Transition task pane, check Automatically After and enter a number of seconds. 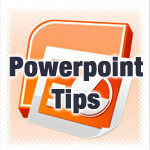 In PowerPoint 2007, do this on the Animations tab. In 2010, do this on the Transitions tab. I found that 3 seconds worked well for simple slides. Uncheck On Mouse Click.